Back in October I head a two day work conference to attend in Cardiff. For a short while I did consider if I might be able to ride all the way from home in Sussex, but I soon realised that would be a two day trip and involve lugging a lot of extra luggage on the bike. Instead I calculated that I could combine a visit to my parent’s in Wiltshire with making a day trip of (a part of) the journey. I’d still be carrying a lot of clothes and work equipment, but it shouldn’t weigh any more than I might carry on a regular tour. Having planned the route I did realise that I might not make it all the way to Cardiff in time without having to be completely heads down and without having time to stop and look around at any point. There was a pre-conference meal to attend which meant I’d need to be there just too early to realistically make the whole distance on the bike; but I was happy with my amended plans which would still see me riding across the border into Wales. I headed to my parent’s house the afternoon before the ride and made myself ready for a reasonable start in the morning. I was on my way just after 8am. I left Mere and started out for a mile or two along the fairly busy B3092, in the general direction of Frome. However before too long I turned off onto the first of many back lanes from which I could join NCN Route 25 headed for, in the first instance, Longleat House. That was still a few miles away though and before I could start to think about that I had to pass another stately home, Stourton, or Stourhead, House. Stourhead is mostly known for its fantastic landscaped gardens, but the house is quite nice too and the official cycle route takes you through the gatehouse and right past the front door. The route continues on along some country lanes. Through Kilmington the fields and many of the roads were packed full of pheasants. I’m assuming that shooting season was a short while away. For now they were enjoying some massive pheasant raves in the Wiltshire fields. From Maiden Bradley I turned onto some very familiar lanes heading towards Horningsham. These lanes I have been down hundreds of times on two wheels (pedal powered and two stroke engine), four (I learned to drive down these roads) and more (on the bus to college in Trowbridge). It was lovely to be coming back down these roads on a (push) bike again. I was probably about 6 the first time I came down this way. I made the most of the nostalgia trip; although now the roads seemed much shorter than they did then and I was soon descending the hill into Horningsham. Crossing the road by the Bath Arms I ignored the “strictly no entry” signs and rode through the gatehouse at the end of the lovely long drive leading out from Longleat House. This was always a no entry road; however it was also an unwritten rule that locals were fine to ignore it and carry on regardless. That did at some stage become harder for cars (although it rarely stopped us) but now the big barrier was even trying to prevent cycles. I might have been acting the cussed bugger that I can be, but I carried on around the end of the gate. For one thing this is still the route of NCN25 and as such I was sticking with it. For another, the tightened restrictions are the result of Viscount Weymouth who now runs the estate. I went to school with Ceawlin. He was in the year below me at the local comprehensive school in Warminster. I couldn’t bring myself to be stopped going the way I’ve always gone by an old school friend (though I can’t claim to have known him that well). 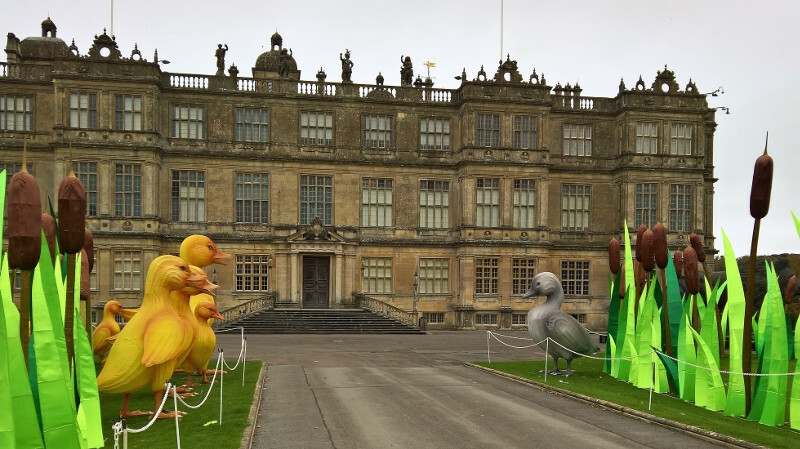 One of the things that Ceawlin has brought to Longleat under his stewardship is a rather random festival of lights around Christmas time. 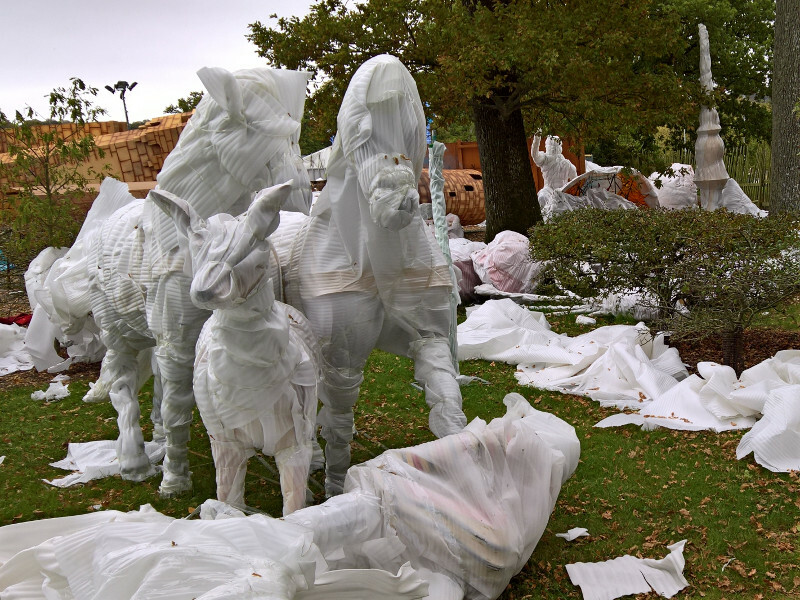 I’ve not actually witnessed it but am aware that the grounds get filled up with all manner of paper based creations shipped over from China. Work was just starting on preparing the display for the upcoming season. Christmas was still two months away but this is a big operation. 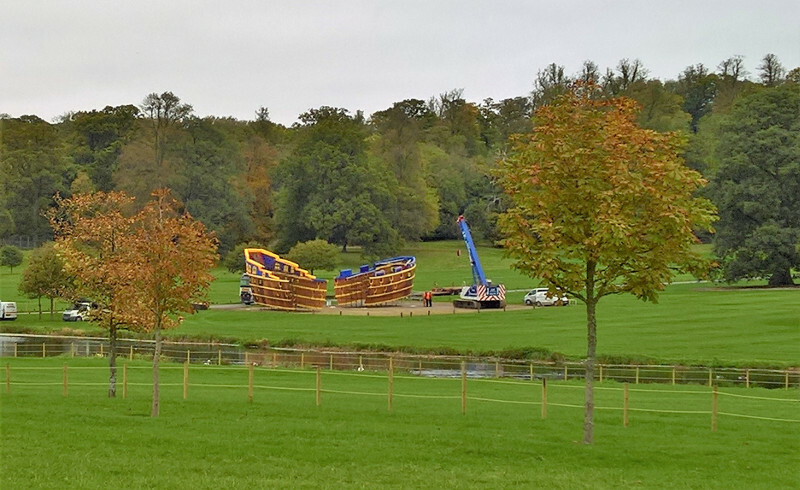 A pirate ship was being assembled on the other side of one of the lakes. Outside the main house a bunch of massive ducklings were engaged in a stand off with the resident lion. A herd of deer were getting lost in a maze just around the corner Around the back of Oscar’s Nightclub (in these parts of the world we had to go to the safari park for the night life) yet more animals were still packaged up. Leaving Longleat I swapped onto cycle route NCN24 and headed along the roads out of the estate towards Frome. The riding was good. The weather was behaving very nicely for October and I was making good progress. I came into the edge of Frome. An odd town is Frome. Growing up in Wiltshire but living close to the border, the neighbouring Somerset town was always something of ‘the enemy’. It was also always pretty run down. The only thing it had going for it then was the Westway cinema, where I watched everything from Watership Down to Jurassic Park. The cinema is still going. It’s one of the small independent cinemas that survived through the multiplex years. This makes me very happy. In recent years Frome has become an up market trendy town. I’m still not sure how that happened and I can’t quite believe it. Foo Fighters played there recently. I can’t get my head around that. Don’t get me wrong, it’s always been quite a pretty town with its tight cobbled streets and medieval and Georgian shops and houses. But there was never anything to really do there. Now it’s (I find it hard to bring myself to say this) quite nice. The cycle route however only skirts around the town and not into the centre so you’ll either have to take my word for the above, or take a diversion if you want to see for yourself. Leaving Frome I started to head into the Mendip hills. The Mendips are less well known than other areas such as the Cotswolds but are equally as pretty and despite the increase in hills I was enjoying the riding. After getting stuck in a cow based traffic jam I dropped down into Great Elm past a lovely river valley and up a steep climb the other side. Just past Great Elm NCN24 takes a long(ish) but, presumably largely flat, diversion along some abandoned railway lines towards Radstock before turning through 90 degrees towards Bath. I chose however to ignore the easy way and instead took the direct, but hilly route cross country and up the steep climb into Buckland Dinham instead. On the approach into the village I saw someone coming the other direction who was too busy looking at their phone. They had not noticed me at all and were veering across the road straight towards me. Fortunately they were driving one of the fancy self driving vehicles that they use in these parts. By which I mean that the horse saw me and moved back to the side of the road allowing us to pass each other safely. The day was still early but I wanted to head through Falkland and visit, even if only from the outside, Tuckers Grave Inn. One of only a handful of proper cider houses left in the U.K. Tuckers Grave is a true piece of history. At the time I was visiting its future was uncertain with landlady Glenda looking to finally call last orders and sell up. It is over 20 years since I was last here but the very fond memories remain strong. Being in a very remote location one always needed a designated driver. Or of course you could get there; throw your coat in one of the tatty tents out the back; get drunk and then crash out in the field with a belly full of rough cider. I was indeed there too early this morning to catch a sneaky half of cider, but I am pleased to report that since I passed by the pub has been saved. If you find yourself vaguely in the area then do pay a visit. There are even plans to reopen the camping field. After passing Tuckers Grave I continued along more Mendip back roads before dropping down into Wellow. A sharp downhill to the ford over the Wellow Brook was immediately followed by an equally sharp climb into the village. 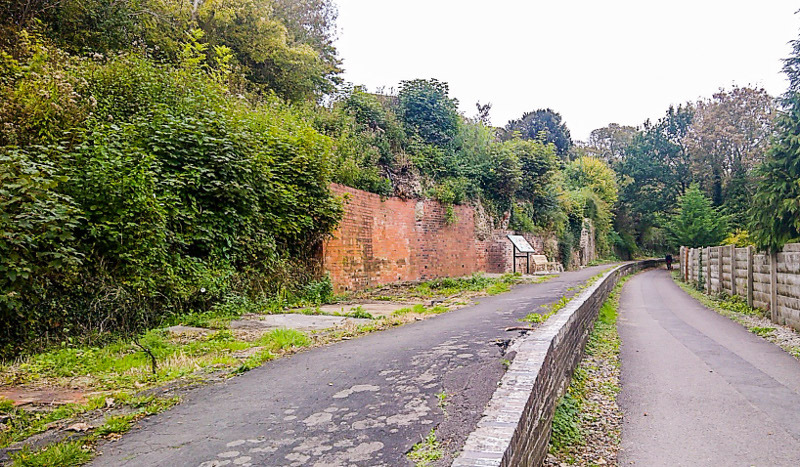 That was the Mendips done with though, as just outside the village I finally joined the track bed of the disused Bath to Radstock railway line. Time for some nice easy miles. I particularly enjoyed riding over the viaduct at Midford; In all my childhood years heading into Bath I’d always been interested in the two disused railway lines that cross over the road here. Until today I’d never had the chance to travel along them and had never seen the old village station. Next up after Midford is the even more impressive Tucking Mill Viaduct – a fantastic piece of railway architecture. I took a few minutes to walk down the path at the South end of the viaduct into the valley to admire it properly from below before continuing on my way. Shortly after the viaduct the track goes from being above the land to venturing deeply into it as the track here is part of the ‘Two Tunnels‘ route. The first tunnel, underneath Coombe Down, is over a mile long and is now the U.K.s longest cycle and footpath tunnel. It’s a fantastic experience to ride through. The tunnel seems to go on for ever but is beautifully lit and there are various sound and light installations hidden along it length. A second tunnel follows quickly afterwards before eventually emerging to the west of Bath city centre, close to the site of a fatal rail crash. Neither tunnel has ventilation shafts and in 1929 a heavily laden goods train was travelling too slowly from Midford; the driver and footman passed out due to the ensuing fumes causing the train to race downhill out of control out of the tunnel where it crashed into the goods yard killing the driver and two railway workers. 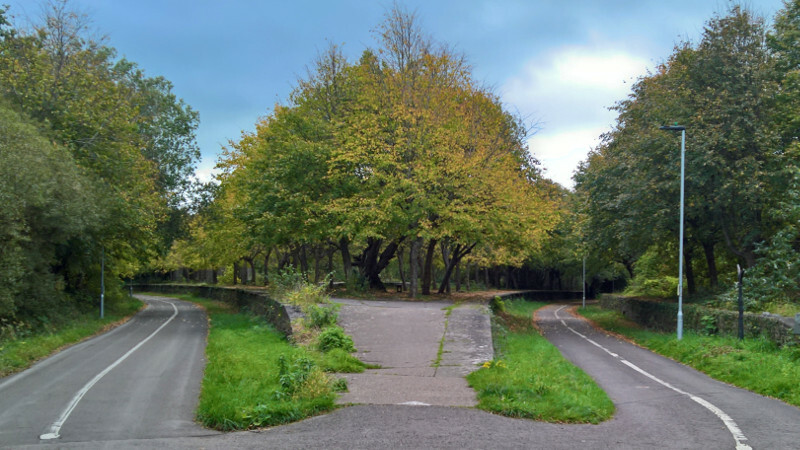 Around the Twerton area of Bath a short distance of riding along a handful of side roads is required to link from the Two Tunnels route to join the Bristol to Bath Railway Path on the other side of the River Avon. This is another long stretch of traffic free cycling down the Avon Valley. The riding is lovely and easy and the next few miles flew by. The path crosses the river at Saltford. The bridge is a notable part of UK cycling history as it was the restoration of this bridge, and its transformation for cycle and pedestrian use, that was the first project run by the organisation which was to become ‘Sustrans’; the charity behind the National Cycle Network. A little further on a small railway halt in the middle of a field marks the start of a stretch where the path is shared with the restored Avon Valley Steam Railway; further on again at Bitton the railway proper starts at the line’s headquarters station. By now it was just gone half past twelve and the railway station café looked to be a great place to stop. I parked the bike up and made my way into the station buildings. The food hit the spot and I was soon refreshed and ready to go. There were no trains running along the railway on that day but I was allowed to have a good wander along the platform and had a good nose around. Back under way the cycle path skirts around the railway sheds, and then alongside and over the track next to a long train of railway repair vehicles; all good stuff for the amateur train geek. The train line only runs for a few miles of restored tracks before the cycle way and footpath have full use of the track bed again. 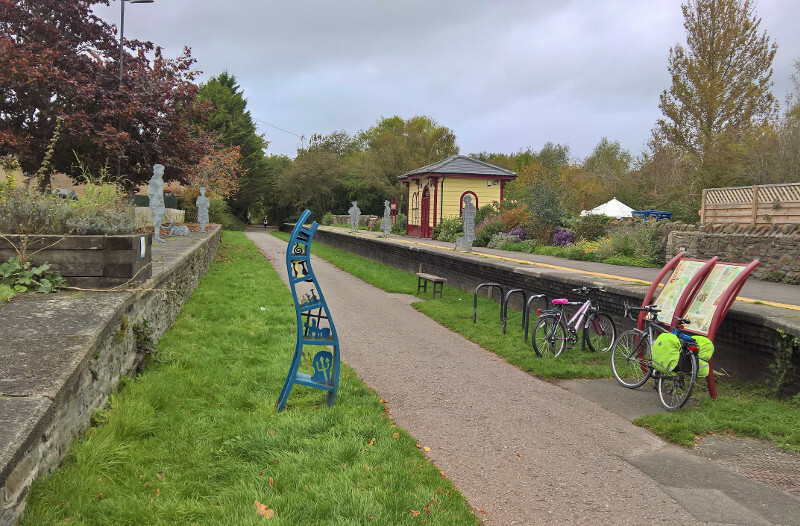 The cycle path continues along a nice easy journey past some sculptures and more old stations before being forced to divert onto a number of other cycle paths where modern main roads have cut across the railway line. 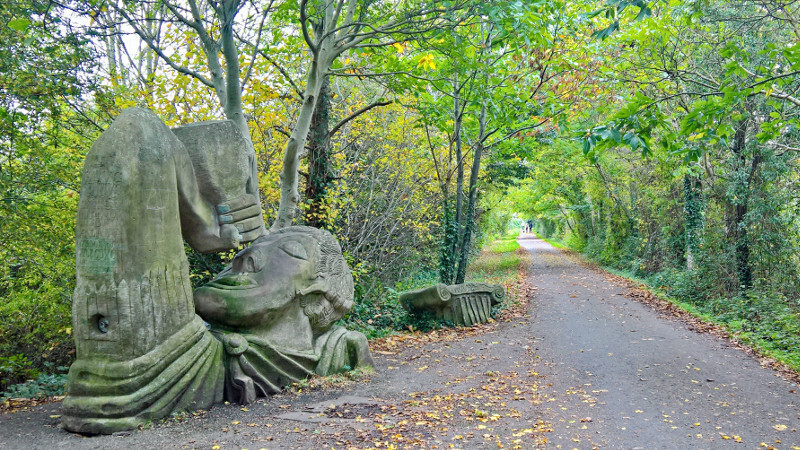 After navigating across the roads, the cycle path re-joins the track bed close to the former Mangotsfield station. The station was a junction of two lines and as such the remains of two sets of sweeping platforms with a large central island remain. 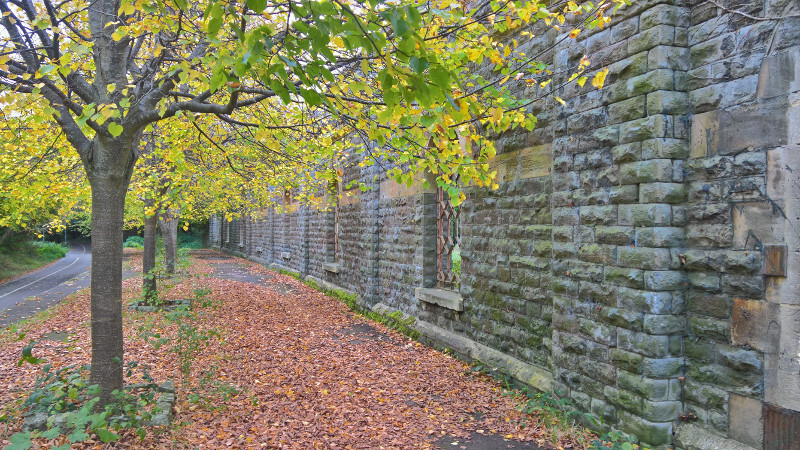 As well as the remains of the platforms the shells of some of the buildings also survive and trees have planted at the former locations of the platform canopy pillars. The effect is quite mesmerising. From Mangotsfield cycle route NCN4 continues on into the centre of Bristol but this was the end of that particular line for me. Instead I doubled back onto the other old line to follow the ‘Dramway’ route out towards the old Bristol coalfields and towards Gloucestershire. The route is further disturbed by modern ring roads but before long it is back on good, clear, straight and flat former railway lines. The track passes right by the remains of former Brandy Bottom coal mine and a short way further on again a broken pit wheel forms a new sculpture either side of the cycle path. 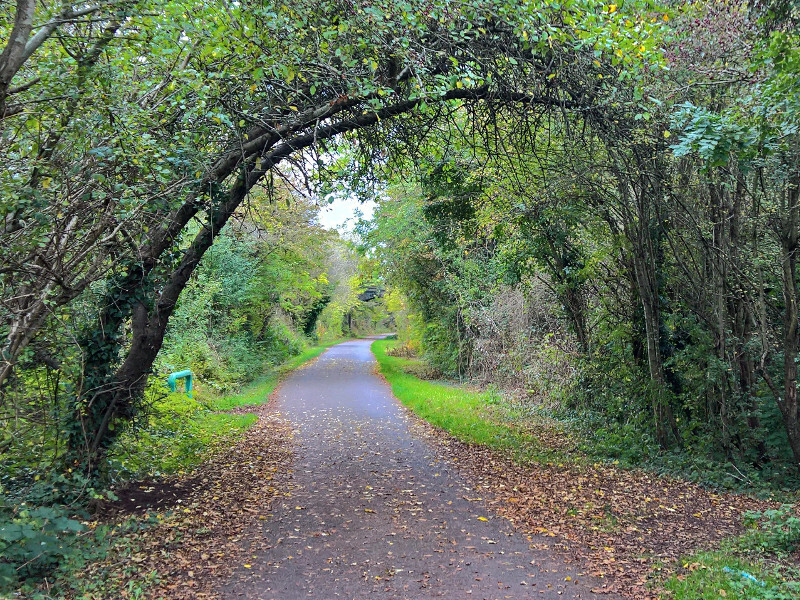 However, shortly afterwards I came to the end of the old railway line; at least so far as the cycle path is concerned, and was back onto country lanes. Some largely uneventful miles followed as I cycled through the triangle of villages between the M4 and M5 motorways, crossing the M5 close to its junction with the M4 at Alconbury. A few more miles on quiet roads had me following largely parallel with the M4 and M48 headed towards Aust at the English side of the (original) Severn Bridge. I might not have been planning on making it all the way to Cardiff on this trip but the plan was very much to cycle across the Severn. This is nice and easy to do, weather permitting. 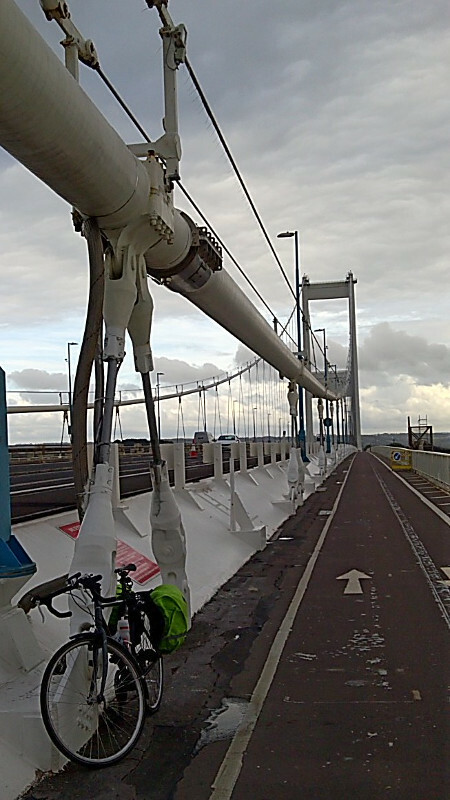 Unlike the M25 Dartford Crossing on my previous big day ride outing, the Severn Bridge has a separate foot and cycle path (also used for bridge maintenance vehicles) on the outside of the road deck. The wind on the bridge was strong. Although the rest of the riding had been quite clam the wind had picked up and it was easy to see why this bridge is so often closed. 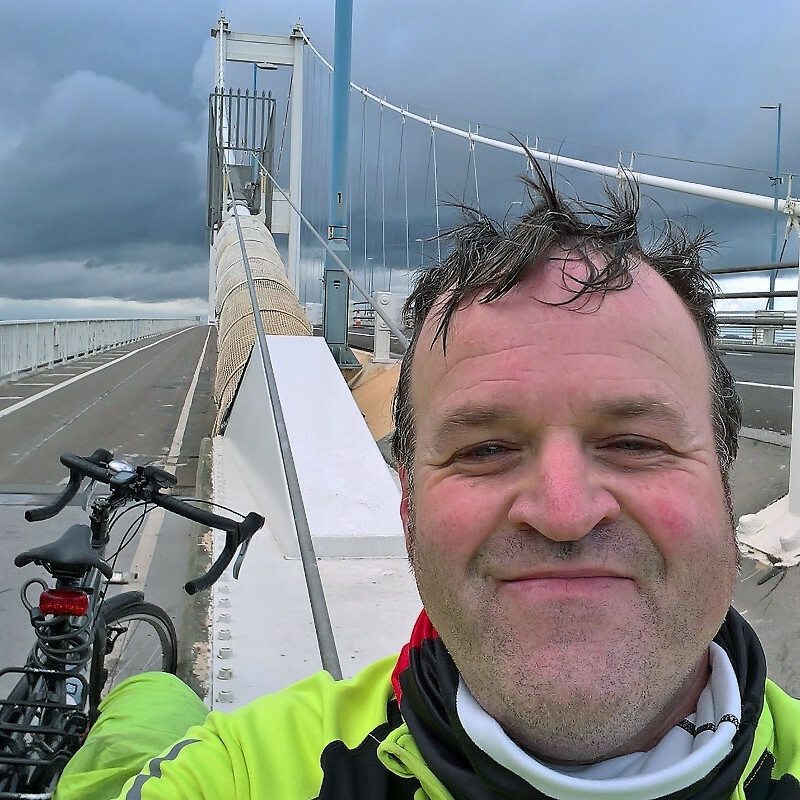 The riding was quite tough as a result but exhilarating and the bridge certainly gives a proper sense of crossing over from England into Wales, giving quite a feeling of achievement. Having made it to Wales it might have made some sense to just head for Chepstow station which is quite close by on this side of the Severn; I had the Severn Tunnel Junction station in mind instead as my final destination. Leaving the Severn behind I started with a slow drag up the hill on a cycle path alongside a busy dual carriage way into the wind. This was certainly the worst section of the whole trip but at the top I hung a left and turned back off onto quiet lanes again. The riding here was the hilliest section since leaving the Mendips behind and I was getting tired now, but I merrily carried on regardless. The merriment was slightly diminished by the level of traffic on these narrow lanes. A few fields across I could see solid lines of non-moving traffic on the main road. A number of vehicles, including trucks far too big for these lanes, had decided to try and cut across country. My travel was therefore stop start for the next few miles. I couldn’t be sure that I wouldn’t be coming face to face with a large truck (over)filling the entire road around any upcoming corner. 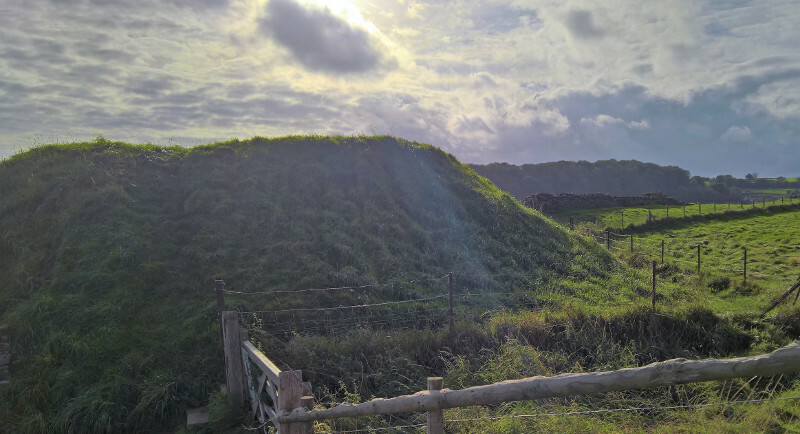 It didn’t last too long though and soon I came, unexpectedly, up to the remains of the Roman fort at Caerwent. 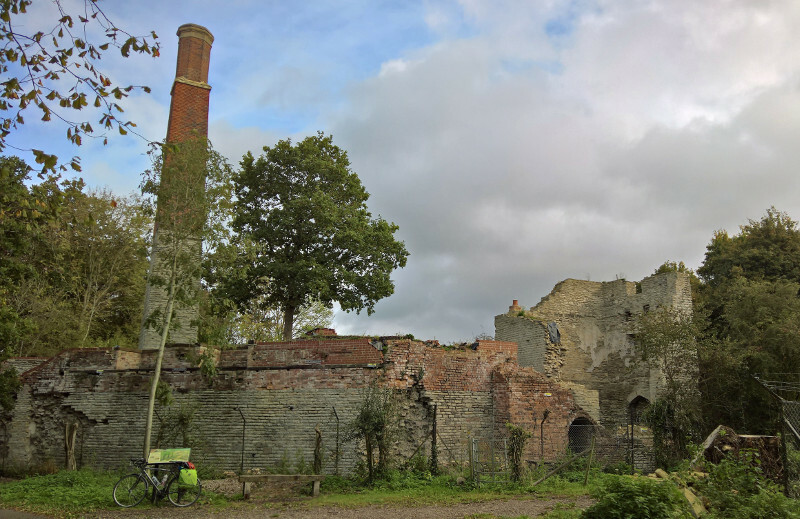 I wasn’t aware of the site and certainly wasn’t anticipating riding past such great remains,. I stopped to take a look. From Caerwent the final miles were easy riding on the flat through Caldicot, along the railway line, and then into Rogiet, aka the Home of Severn Tunnel Junction station and the end of my ride. I had three quarters of an hour before the next train to Cardiff so I went off on a short but hopeless search for somewhere to get some water. My bottles had now run dry and whilst I had finished my day’s riding I needed to rehydrate. There were no shops anywhere in the village however, so I ended up asking a builder working outside a house in the village to fill my water bottle for me which he kindly did. Back at the station I finished off my last few snacks washed down with my fresh water before just about managing to squeeze my way onto the very crowded train to Cardiff; contorting myself into a very uncomfortable position unbecoming for a man of my age and size. Unravelling myself at Cardiff I made my way to hotel (just a few yards from the station) and had just enough time to properly freshen up and get myself ready for the pre-conference meal. This might not be the traditional way to make your way to a conference but I can highly recommend it.